The Quidditch ﻿Global Games… Wait, what? | Damian Trasler's Secret Blog - Do Not Read! 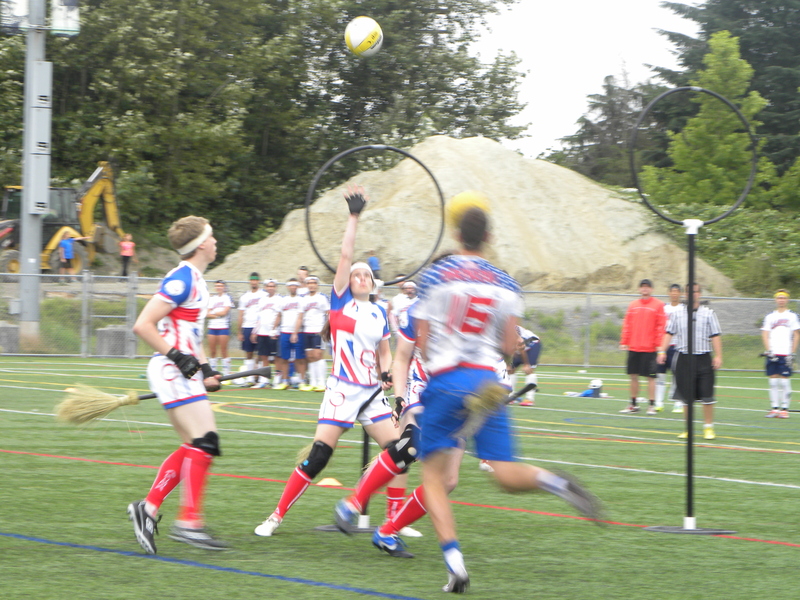 The Quidditch ﻿Global Games… Wait, what? Despite the darkening tone of the books, there’s no denying the appeal of the magical world depicted by J.K. Rowling, but it’s nonetheless surprising that one of the few things to leave the books and arrive in the Muggle world, along with Chocolate Frogs and Bertie Bott’s Every Flavour Beans, is Quidditch. 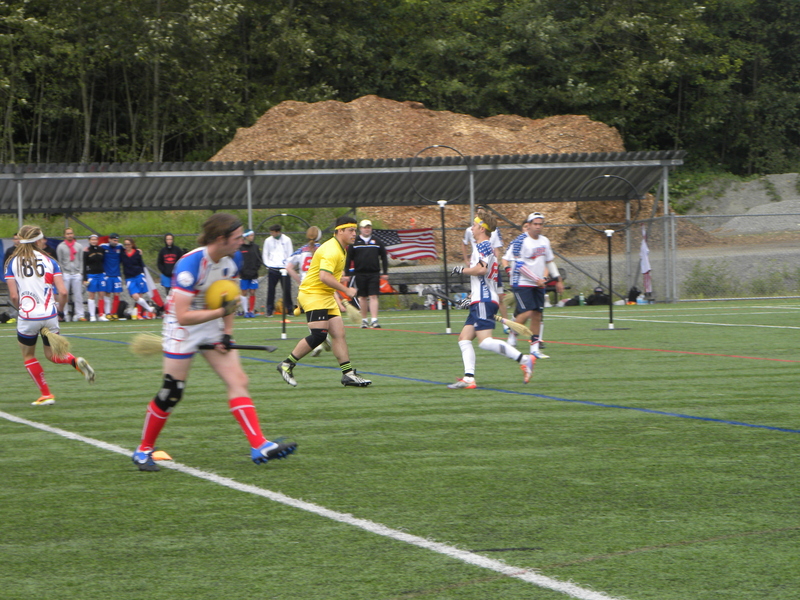 A GB player attempts to defend the goal from another determined US attack. He’s the Snitch. To score, you have to grab what’s dangling from his shorts. But there are more similarities with the written game of Quidditch than differences. All players have to be on broomsticks, making catching the thrown Quaffle (here substituted by a Volleyball) that much harder. The Beaters may not have bats, but they throw the Bludgers (gym balls) at opposing players, and if you’re hit, you have to drop the Quaffle (if you’re carrying it) and run back to touch your own goalposts before returning to play. And there are three goalposts at each end of the field of play, two low hoops on either side of a higher central hoop. This shot of Team GB leaping into action at the start of the game shows the three goals nicely. Also the ACE team strip! 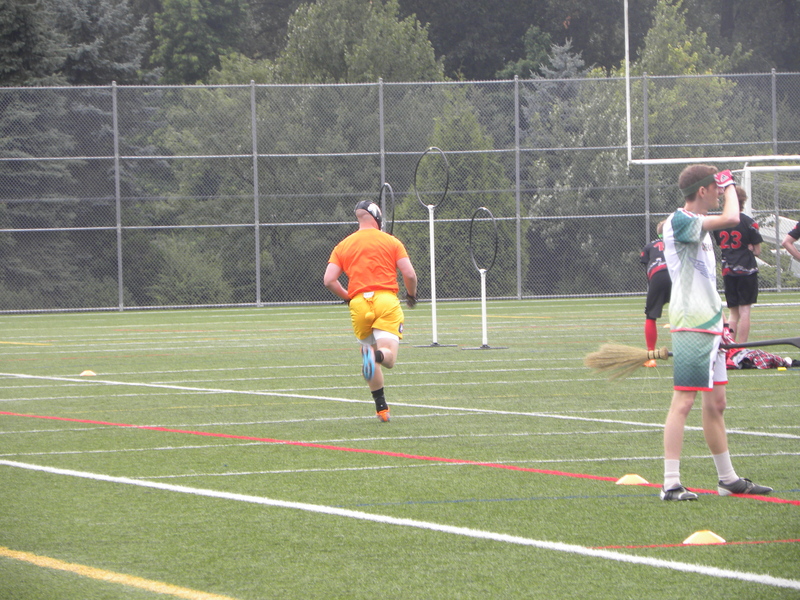 Like the books say, Quidditch is a fast and furious game. There were no injuries in the UK/US match we watched, but the game preceding it was stopped twice for injured players to be helped off the pitch. Two beaters…er…tussle over the Bludger. Eventually a UK Beater tapped the US player with the other Bludger and released his team mate. 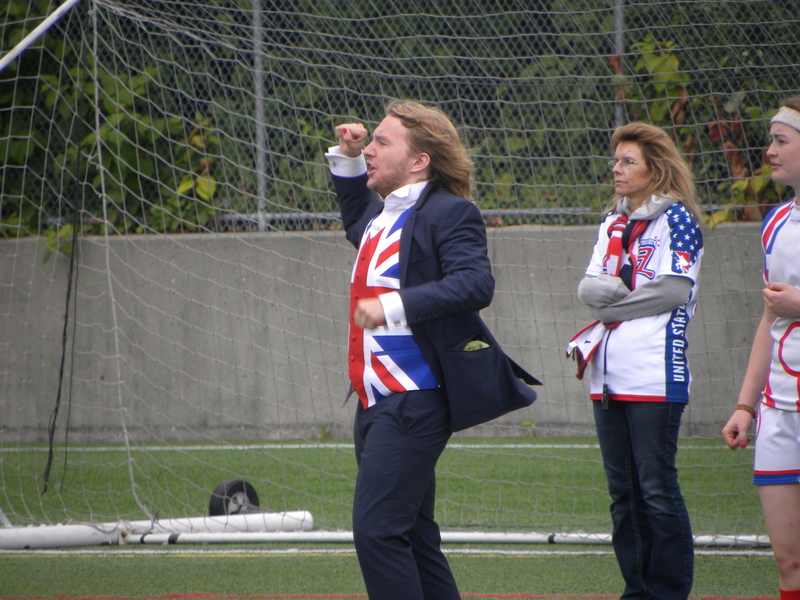 The UK team manager/coach had the right outfit, the exuberance and the team spirit. Possibly he should have studied the tactics as well…. This entry was posted in Uncategorized and tagged Canada, Global Games, J.K. Rowling, magical world, Quaffle, Quidditch, Quidditch World Cup, Snitch, USA. Bookmark the permalink.